LBACS Animal Control Officer Heidi Poe cuddles a kitten saved from one of the fire sites. 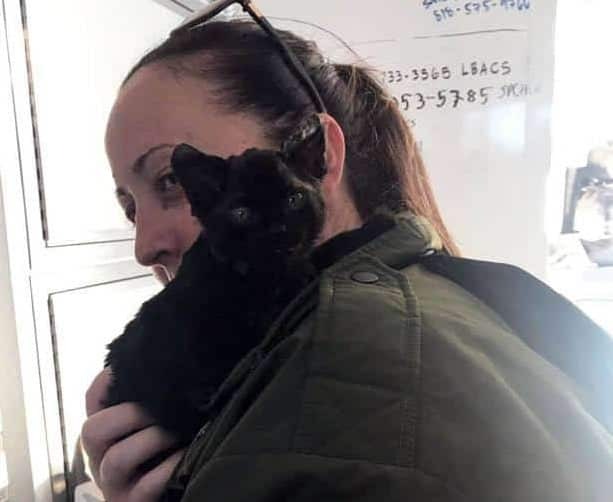 The kitten is now at LA County Animal Care and Control and is being treated for burned ears. The kitty’s intake number is #A52335635, in case there’s any interest. Photo courtesy of LBACS. Beginning Nov. 9, Pierce College in Woodland Hills, Operation Blankets of Love, The Little Angels Project in Agoura Hills, veterinarians and scores of volunteers and welfare groups benefiting both humans and animals joined forces to assist the wildfire evacuees—again, both animal and human. Their effort bolstered the grueling and heartbreaking work by first responders: firefighting teams, police forces, military veterans, local animal shelters that included Long Beach Animal Care Services and the spcaLA Disaster Emergency Response Team, and the Red Cross, which set up the evacuation center at the college. “Thank you for risking your lives to help save all of the furry friends trapped in this devastating fire. We salute all the First Responders,” read a statement from LBACS. In an article posted Nov. 14, Pierce College’s public relations manager, Donna Clay, numbered the people on the campus at the height of the evacuation at about 1,100. They had begun to leave at the writing of the article. Clay also said that the Pierce College Equestrian Center the Pierce College Equestrian Center sheltered 280 animals and was well over capacity during the most intense period. The Center, which generally houses horses during emergency evacuations, also took in farm animals. People were allowed to keep their pets with them in the gymnasium as long as they animals were crated. OBOL provided many of the people with crates. As of this writing, the fires burning in Southern California have been reported at 69 percent containment and 45 percent in Butte County in Northern California. Considering the losses of life and property and the risks taken first responders and other agencies, there’s a ring of hollowness to the updates. This isn’t a movie—the blazes are still being combated and the death toll is still rising. Vehicles that caught fire with people still in them have been referred to as tombs. Residents are still unaccounted for. Woodland animals who must have tried to flee in terror have died horrible deaths. It goes on, as relentless as the infernos themselves. Generosity from the community, however, has been overwhelming, as noted by volunteer Darlene McInerney, who marveled at the “buckets of stuff” donated at the Center. However, a report posted by Market Watch said that some shelters are running out of room because of the flood of generosity and advised anyone wishing to help to contribute cash or gift cards. The Red Cross and other agencies will then purchase the necessary items. If you want to contribute, access any of the following links. Your donation to the American Red Cross will help both pets and people; the Humane Society of the United States has a fund to protect and assist wildlife. These are trusted organizations; but as always, please be wary when searching for charities online—scammers will take any opportunity to display their heartlessness by creating bogus donation sites. Pets in shelters and ones belonging to displaced humans need temporary housing. Los Angeles Animal Services is in great need of foster homes. Links to shelters in need of people willing to take pets into their homes until they can be safely relocated can be accessed here. Live Love Animal Rescue has several foster homes lined up. Volunteers are ready and waiting to offer transport assistance for pets as well as shelter for them. They continue to contact shelters and rescues. Contact [email protected] if you know of anyone who needs foster help. Helen Sanders CatPAWS will provide boarding for two pets at a local pet hotel. Contact [email protected]. “If the air quality is poor, if people are suffering, pets are suffering,” said Peter Weinstein, DVM, MBA, executive director of the Southern California Veterinary Medical Association. Weinstein was among the veterinarians deployed to Pierce College to assist with pets found in distress. He advises pet owners in areas reporting even moderately unhealthy air to use common sense. Senior pets, pets with asthma and brachiocephalic breeds such as pugs and bulldogs, which already have difficulty breathing, should be taken special care of. Birds, he said, are “exquisitely sensitive” to dirty air and should not be left on porches and in cages near open windows. Closing windows, using an air purifier, putting clean air filers into the home and running the air conditioner, if you have one, helps keep the air clean. If you’re not in direct range of the fire and your dog needs outdoor exercise, walk them until they’ve used the facilities and then bring them directly indoors. In other words, Weinstein said, don’t expose your pet to something that you wouldn’t expose yourself to. He was doubtful, however, about face masks for pets. “I don’t think that a golden retriever would keep one on,” he said. In California at least, this horrible experience may become a way of life in areas subject to fire. We also have earthquakes and the threat of sea-level rising, so it’s best to be ready. Make a Plan Your plan should include what to take if you have to evacuate, where to evacuate to, two evacuation routes and how you will communicate with family members. Include all pets in your plan. Prepare Supplies Include emergency medical kits and supplies for your pets. Don’t wait—evacuate! Stay tuned to the news and check for updates. If fires are anywhere in the vicinity, don’t wait to be told to evacuate. Evacuate immediately. [In the case of fire,] winds can shift and change direction of the fire in seconds. Take your companion animals with you! Do not leave your companion animals behind! Do not lock them away somewhere you think they will be safe! Best Friends has a detailed emergency list accessible at the link.